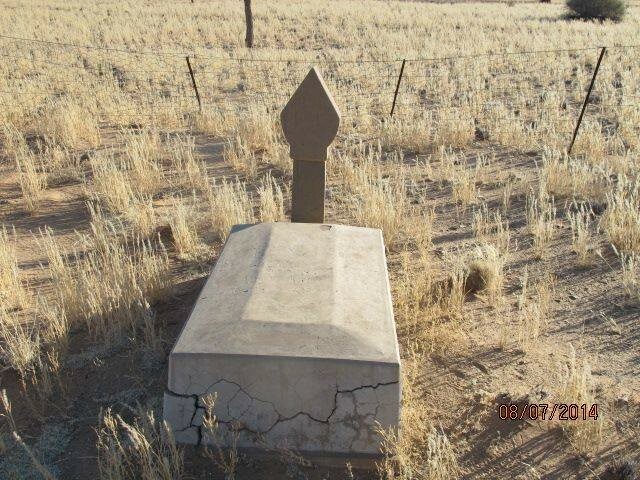 The grave of the still-born baby of the "Outer-Train-Manager" (Pluegbans) le Roux. 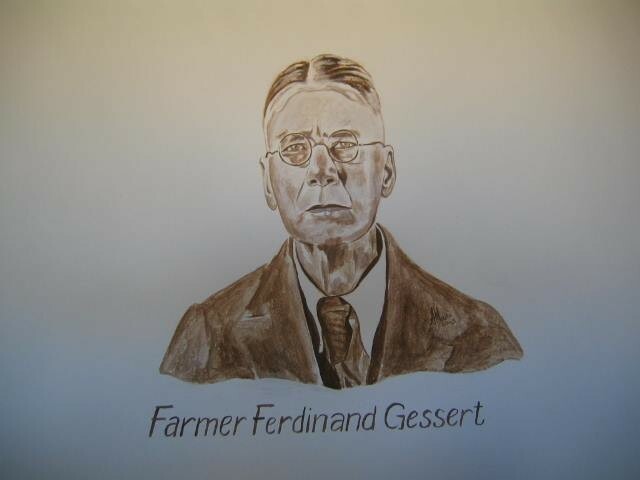 My father, Ferdinand Gessert, was born on 12th of July 1870 in Elberfeld (Ruhr area) Germany. After school he enrolled at a University in Heidelberg Germany and start studying law (Jura) for only one semester. He during this time realized that he was more interested in Physics and then moved to Berlin where the majority of recognized Professors in this field of study were situated. He completed his studies in Physics in Berlin. During late 1800’s the sea-going nations like England, France, Spain, Portugal and Holland already colonized the best areas in Africa, Asia and America leaving least strategic and dessert land for other nations to be colonized. Germans were overjoyed about their first colonies of which Deutch-Sudwest Africa was one of the first colonies in Africa. It is interesting to note that Kaiser Wilhelm II also during this period decided to start an own fleet and ordered Admiral Tirpitz to build Frigates, Cruisers and Destroyers. All Germans has received a new goal to follow and was proud about the decision of the Kaiser. The newspapers at the time wrote with contempt and mentioned that DeutchSudwest Africa was a desolated and dry colony consisting only out of sand and stone. During the rainy season it could however rain a lot but all rain-water is then flowing directly into the ocean!!! The newspaper reports interested my father and he thought that one should harness the rainwater by building proper dams. He in 1885 then decided to travel to Deutch Sudwest Africa to assist Kaiser Wilhelm II to develop this colony. He travelled to Hamburg, purchased a boat ticket for Cape Town from where he travelled by ox wagon to Deutch-Sudwest Africa. He, after weeks, arrived in Keetmanshoop and made his way to Bethanien where the Captain of the Bethanien Nama tribe lived. Once in Bethanien the then Missionary Heinrich arranged a meeting with the Captain. My father has asked the Captain if he was willing to sell him a piece of land that he was prepared to pay well for. He mentioned to the Captain that he intend building dams with the purpose to store water so that it would not flow unused into the ocean. Captain Paul Frederiks was willing to sell land but requested my father to first investigate the area and then give feedback about suitable land that he would like to purchase. My father purchased a horse and rode through the area, mainly in the vicinity of Bethanien. 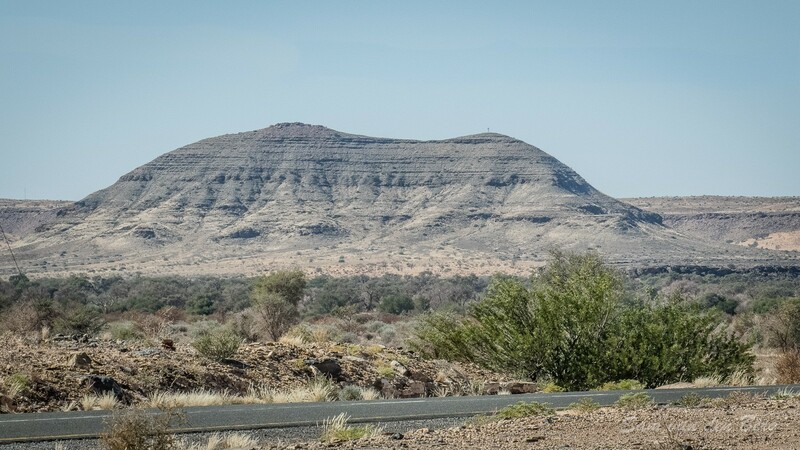 He finally decided to purchase an area south of the !Nachab Hills (Drieling koppie) through to the west of the Konkiep river bed and up to the east of the river bed of the Fish River. This area of land best suited his idea of building dams. He again visited the Captain and conveyed his decision where to purchase land. The Captain agreed with the proposal as he had no need for that part of his land. He also decided, due to the fact that the area had no significant fountains or water holes, that my father could purchase land in the proposed area as big as he could encircle in one day with his horse. Missionary Heinrich drafted the contract that was signed by Captain Frederiks and the whole Nama Council. The then District Chief Lieutenant Baron von Stempel as well as the Governor of Deutch-Sudwest Africa, Major Leutwein, gave their approval to the purchase deal. The purchase contract is still in my possession. Interesting to note is that it is stated in this contract that my father assisted financially with the Bethanien Klipkirche (Stone church) that was build in 1898. The Gessert family was invited for the centenary celebrations in 1998. I donated two Oryx for the festivities that was shot by Captain David Frederiks of the Bethanien Namas. Dr Vogt of Windhoek also attended the celebrations. His mother was born Bertram and I was with her in the German hostel in Luderitz. His father had a nursery in Luderitz. My father purchased in total 48 000 hectares land in the Bethanien district. He named the farm Pavian Kranz and Witputz. My father gave the farm as a present to my mother who renamed it Waldsee. My mother died in 1934 after which time my father sold the farm Waldsee to Rudolf Kober. My father lived at !Inachab for the first years. His first house had to be build out of natural stone of which the ruins are still visible today. Just below the stone house were a well and a garden. He started purchasing oxen, cows and black Persian sheep after he founded sufficient water. As intended, my father erected fences, dug wells and constructed dams. New wells were dug and dams build at the sites !Nachab, Poufontein, Kunab, Kouchab, Oriameb, Onarwib and Tsabifaints. All wells were fitted with wind pumps. In those days nobody had experience of constructing dams in DeutchSudwest Africa and no statistics were also available about rainfall or how high / strong rivers flowed. He constructed 6 dams, one behind the other, but after the first rains all the dams were washed away. After investigation it transpired that all overflows eroded and that it will be necessary to construct dams with higher walls and overflows in such a way that it would run over hard rock. My grandfather lived in Wiesbaden and went each year to the Riviera. He normally visited the botanical gardens in Lamortola. During one of these visits he met a German Gardener Apprentice, Kurt Dinter. The apprentice was invited to visit Deutch-Sudwest Africa so that he could study the plants in the area. The plants fascinated my father as it differs completely from that in Europe. Plants to a large extent also had not been named yet. He was interested in such study tour but first had to improve his English language and obtain approval from Kew Gardens in London to work in Sudwest for one year. Kew Gardens approved the study and after one year’s study he sailed to Luderitz and travelled by ox wagon to Ferdinand Gessert at !Nachab. Kurt Dinter and my father sat together and decided to import usable plants from all over the world where there were desserts and to see if these plantswill adapt to the Sudwest climate. They thus ordered Eukalyptus seed, seed from salt bushes from Australia, cactus leaves from Mexico and the USA as well as date pits from Algeria. An American Wonder-plant grower corresponded a long time with my father and he send my father leaves of 28 cactus types as well as seeds of the Prosopis tree. These leaves and seeds were all planted in a small garden where they grew well. The unimaginable then happened. The water became brackish and unusable for man and plant. All plants thus died. Mr. Dinter then decided to take a botanical route by foot and to see if he could not be employed as a botanist in Windhoek. Government employed him as a botanist in Windhoek but he, as the case was with all German Government employees and soldiers, was expelled from Sudwest. He became a very famous Professor. 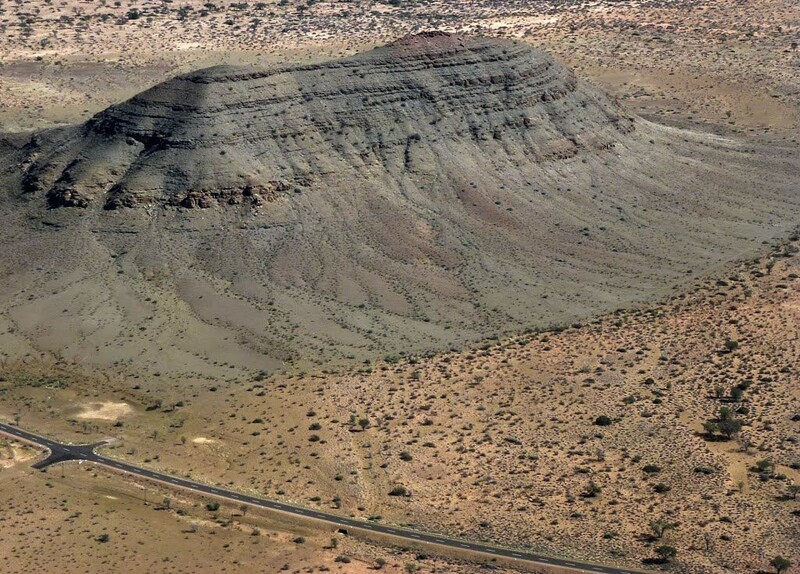 Mainly Namas were buried on the eastern slope of the mountain near the Sandverhaar homestead. They most probably used this area as a burial site as it was easy to dig graves in the sand. Namas lived at Sandverhaar for a very long time, even before the basters moved past there in 1872. The name of the place at that time was Hunobis and belonged to the eldest daughter of the Captain of Bethanien and their family. They apparently only lived there when sufficient water was available for their livestock. 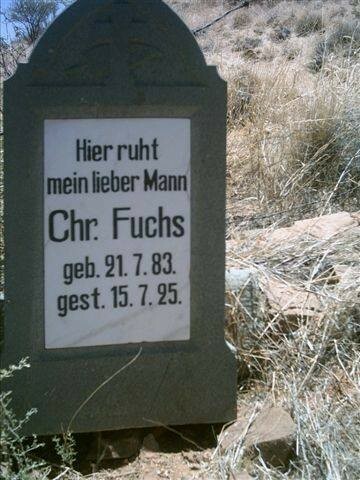 Christian Dirk Fuchs was buried in the grave on 1926/1927 at the foot of the mountain about 200m west of the Nama graves. Dirk died before I went to school. Fuchs was always sick and died of the sickness. He was a soldier (Schutztruppe) and was married to a baster woman. Many German soldiers married baster girls as there were only a few German women at that time. Willem, Dirk’s brother, has also a baster wife (born Coleman), who was the sister of Henry and Matias Coleman. Willem who was married to Gerda Siebert leased the Kukanas / Kuganis area from my father. His sheep and goats grazed the area from there to the lower Gurib up to Kahlen Kop (Bald Head). As compensation to my father he had to transport freight with his donkey car. He transported for instance all the stones, cement bricks, sand etc that were needed for construction of water reservoirs and animal troughs as well as camp material and wind pumps for installation on boreholes. Henry and his wife died before we moved to Germany. 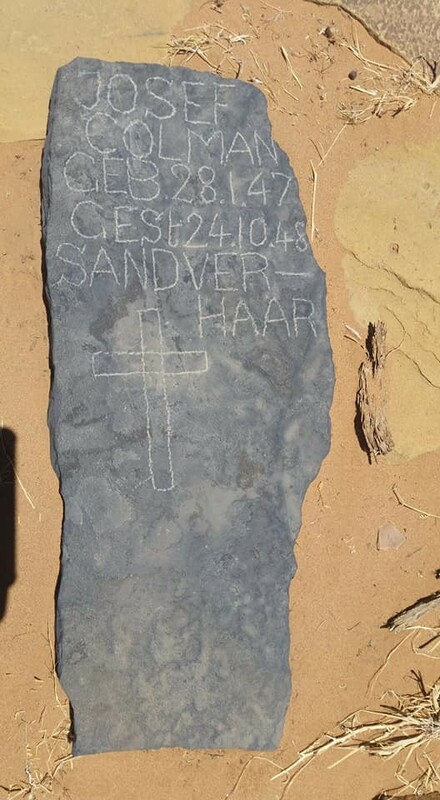 The grave at the railway track near Sandverhaar station was the child of the Outer-Train-Manager (Pluegbans) le Roux. The child was a still-born baby and was buried in 1928. A continued presence of 10 to 15 German soldiers (Schutztruppe) was at Sandverhaar under the command of 1st Officer Lieutenant Berlin. They were stationed at the farm to protect German farmers from roaming Namas who declared war on the Germans. Peace was only declared in 1907. The soldiers did not lie around on the farm but assisted with the digging of wells and used the soil that was excavated to make bricks. The bricks were used to build their own accommodation. Slightly higher on the mountain a mini castle was build for Lieutenant Berlin. Sandverhaar was a water station during German occupation. The tanks of steam-locomotives were filled at this station. Two steam machines pumped water from two boreholes located in the Sandverhaar River to a big tank that was situated 60-80 meters from the station house. The foundations of the house are still visible on a small hill next to the river. The hill was of slate and was dismantled to build the railway service road next to the rail track in the direction of Feldschuhorn. The calk oven at Kukanas / Kuganis, Sandverhaar already existed when my father bought the farm from Tommy and Jimmy Hite in 1900. At Kuganis there was also a well with enough water, not deeper than 30-35 feet with the water level between 15-20 feet. 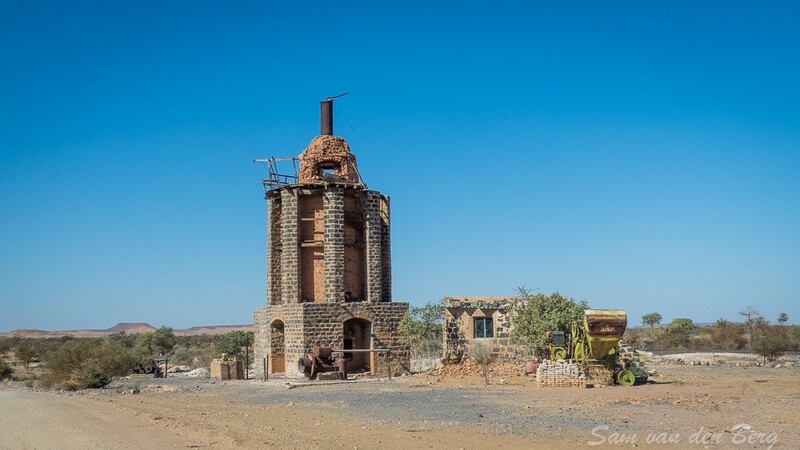 I asked Old Namas: Old Willem Rooi and Old Tisib Bantaner when this Calk Oven was build. They replied that the oven was already there when my father bought Sandverhaar. I also asked Wilhelm Wickbreder who build the oven. He asked Old Siebert from Geigorab who mentioned, as far as he could tell, that a Sandberg built the oven. Sandberg later owned a Hotel in Mariental, sold it in 1938 and then emigrated to the USA. Nobody could say if Sandberg was a builder by profession. I could imagine that it would have been quite difficult to transport burnt lime from this oven loaded on an ox wagon to the “baiweg” and then to Keetmanshoop. The lime was burnt with camel thorn wood that was collected in the Gurib River. 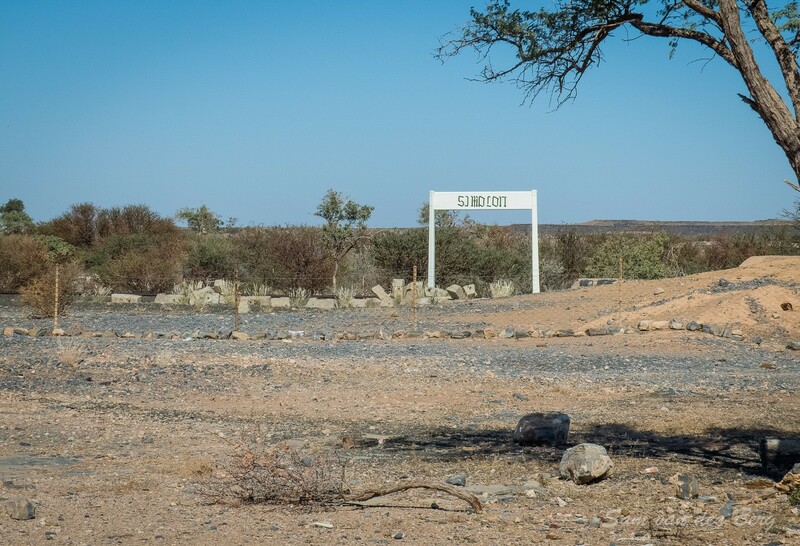 At the completion of the railway track from Luderitz to Keetmanshoop during 1904 – 1908, a calk oven was build on Simplon in 1909 / 1910. This calk oven looked exactly like the one on Kuganis. The plot was named Kalkwerke Sandverhaar. George Kottker requested, after completion of the railway track, a piece of land from the Government. A farm of approximately 16 - to 17 000 hectares was allocated to him and was named Simplon. He was under the impression that the piece of land Kalkwerke Sandverhaar would also be given to him. He continued with lime burning in the Calk Oven at Kalkwerke Sandverhaar and always said to me: “Every lime stone that I burn is a grass clump (tussock)”. The oven was still laden with a cork screw, – packed with a layer camel thorn wood, then a layer calk stones and set alight. Karl Schneider bought Simplon in 1938. Kottker has sold the property due to old age and went to live in the Kubis where the drill colony was earlier situated (at the bottom of the river). Kottker was an old Schutztruppe, married to a nurse, but had no children. Schneider modernized the Calk Oven by building higher walls and installed a small motor so that he could load the oven much faster. For burning of the lime stone he changed from camel wood to coal that he ordered from South Africa. The disadvantage of this burning method was that he had to remove the coal sludge from the lime and needed 10 to 12 Ovambo’s (lime workers) for this work. The cost to produce lime by this method was very soon not any more cost effective with the result that prices were higher than that of the big lime workers in South Africa. Willem Schneider, the son of Karl Schneider, with his wife, my son Gernot Gessert and his wife died in an airplane accident on 20 March 1972. Since this horrific accident the Calk Oven was not in use any more.